The picture above is the best thing I’ve ever seen. When I first laid eyes on it, the little writer goose bumps on my arms woke up and stretched. Whoever drew this was a freaking genius, and the tagline is second to none. I’m slightly disappointed I hadn’t already come up with this myself. I think F. Scott Fitzgerald might be the most charismatic novelist to have ever strutted the Earth. The bookstores really should keep his works in a special location for fear they might catch the other books on fire. His shouldn’t even be available in paperback…that’s just asking for catastrophe. Something sizzles madly out of his books and I’ve been shocked a time or two by one of his masterpieces. As I begin to even approach one of Fitzgerald’s writings, before a word has been read, I hear the Big Band music strike up from somewhere I can’t see. I chase the music, never quite finding it, but smell the aroma of a fine cigar on the way. Zelda’s perfume still lurks in the breeze, and something that can only be felt in Paris jolts my senses awake to something of another time. Feeling his ghostly essence in the air, I open the dusty book cover, and let him have me. I chase him about the pages the whole way, trying to reach out for the bottom of his coat, but knowing he is somewhere hanging out in 1927, somewhere I imagination will never fully conceive. F. Scott and Zelda Fitzgerald were fabulous people, and they couldn’t even help it. Like the pink sunglasses he wears in the picture, his allure sat on is face like a quirky accessory. However, that draw pulling people to him while the words spewed out of him, was attached. Whether he was troubled, tormented, brilliant, or busted, he was wonderful. He wore Zelda on his arm as perhaps one of his only flaws, and it made him all the more beautiful. That troubled woman bled out of his hands and onto pages. That endless wit spoke for his generation. Even Hemingway was drawn to him like metal to lightning. Really, aren’t we all? Because I am enthralled with the person, I am intrigued by his works. It’s so obvious Fitzgerald wrote because he had to, and he had no choice but to charm the page with delicious ink. 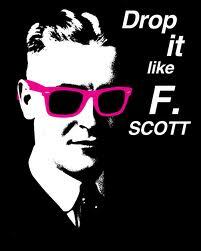 It was F. Scott, and it can’t be taught. I don’t want to learn it either, though a little of him is in me out of pure adoration; I just want to be it, drip with it…and one day when my novel is in a bookstore I want it to sweat the others out, making a sauna of that place because I, by God, dropped it like F. Scott, sweated him and myself both out of my pores, and made scalding literature that will leave the test of time in flames.